Basically, it is a particularly restrictive and pernicious piece of legislation which prevents people from writing or speaking about the FACT that it is indeed possible to cure cancer using alternative methods. 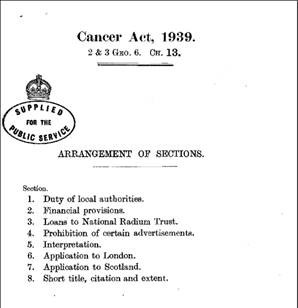 If you do even the most basic research, you will find that among the excuses that have been put forward for the introduction of this act, was to ‘Protect the public from Quackery and Charlatans,’ but it now appears far more likely, to ensure that all types of cancers, were only to be treated by ‘Radium-Based’ methods (Cancer Inducing Radiation). 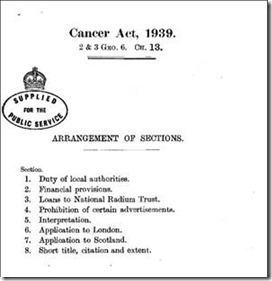 Be the first to comment on "Did you know about the CANCER ACT 1939?"